You are looking at three examples of items we use every day, that were bought at the absolute lowest price possible. If you make buying in bulk a habit, you will never find yourself driving to the grocery store when someone says," Honey, we are out of shaving cream"... if this does happen you will waste the money you spend on gas... and the chances of you finding shaving cream at a rock-bottom price are miniscule. 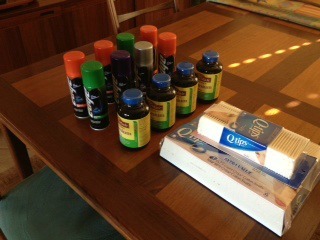 All of these items, were purchased on sale... in combination with coupons... and are items that we use every day. One caveat however, make sure you check the expiration dates... in the case of the magnesium vitamins that you see they will all be consumed prior to their expiration date. I don't know what we would do without Tupperware products in our house. All purchased at Goodwill, my wife would not be caught dead at a Tupperware party. Summer of our favorite grocery stores are Whole Foods and Sprouts, they sell healthy products that we consume every day... here you will see raw almonds, cashews and walnuts... cashews and almonds for snacks, walnuts go on my morning oatmeal. 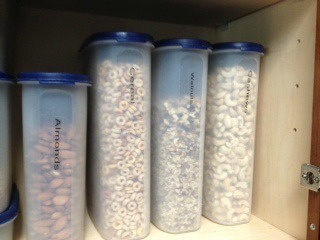 All purchased in bulk, been stored in larger couple were containers, then moved to the containers that we use every day. If you stop and think about it, when you buy scoops of raw cashews, you're not paying for packaging costs and the buying power of large grocery stores guarantees freshness. It is truly a win-win situation, you are not only saving money, you're eating healthy, and you always have healthy snacks available for your family and your guests. It is all part of your easiest ways to save money plan, make a list of items that you use every single day as a starting point...every list will be different depending upon your family. Next scour your Wednesday and Sunday paper for coupons and what's on sale that week... you may only purchase staples once or twice a year, but when you do you know you'll be paying the absolute lowest price, because you've researched and done your homework. One of the basics of https://www.frugal-retirement-living.com, is never running out of something that you use every day... it's wasteful... be smart, stock up and save. Thanks for reading buy in bulk...you'll be glad you did.